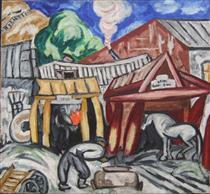 Olga Rozanova was born in Melenki, a small town near Vladimir. Her father, Vladimir Rozanov, was a district police officer and her mother, Elizaveta Rozanova, was the daughter of an Orthodox priest. 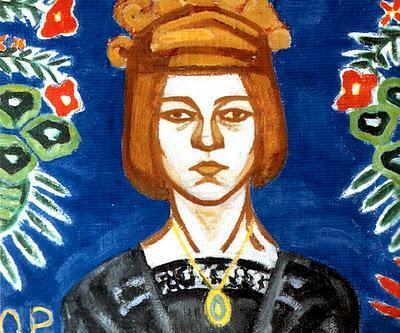 She was the family's fifth child; she had two sisters, Anna and Alevtina, and two brothers, Anatolii and Vladimir. She graduated from the Vladimir Women's Gymnasium in 1904 and moved to Moscow. 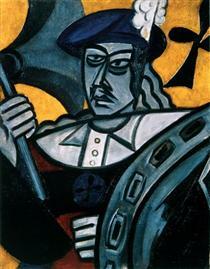 After arriving in Moscow, she attended the Bolshakov Art School, where she worked under Nikolai Ulyanov and sculptor Andrey Matveev. 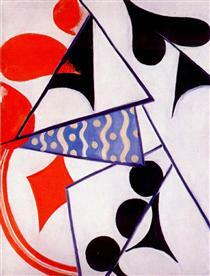 She audited courses at the Stroganov School of Applied Art in 1907, but was not accepted for admission. 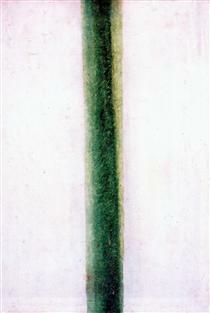 After this, she trained in the private studio of Konstantin Yuon. From 1907 to 1910, fellow drawing and painting students studying in these private studios included Lyubov Popova, Nadezhda Udaltsova, Aleksei Kruchenykh, and Serge Charchoune. 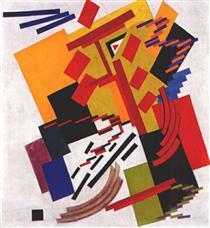 She joined Soyuz Molodyozhi (Union of Youth) in 1911. 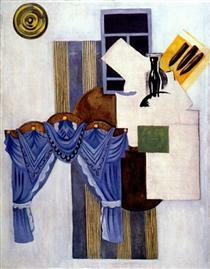 Two of her canvases, Nature-morte and The Cafe debuted at the second Soyuz Molodyozhi exhibition in St. Petersburg in April 1911. 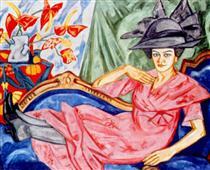 She moved to Saint Petersburg in 1912, and briefly studied at the art school of Elizabeta Zvantseva, which housed many Russian art nouveau artists. 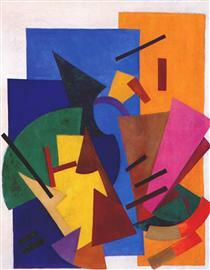 She exhibited two works, Portrait and Still-Life at the next Soyuz Molodyozhi exhibition in January 1912. 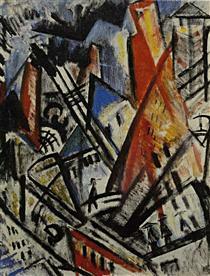 This exhibition was the first appearance of the Donkey's Tail, a Moscow-based artistic group led by Mikhail Larionov. Rozanova later traveled to Moscow to try to establish joint projects between the two groups; these negotiations proved to be unsuccessful. 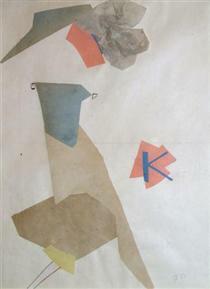 Soyuz Molodyozhi disbanded in 1914. 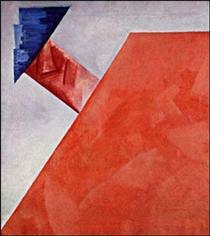 Of all of the Russian Cubo-Futurists, Rozanova's work most closely upholds the ideals of Italian Futurism. 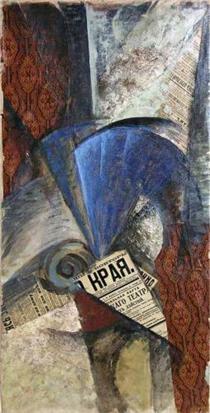 During Filippo Tommaso Marinetti's visit to Russia in 1914, he was very impressed with her work. 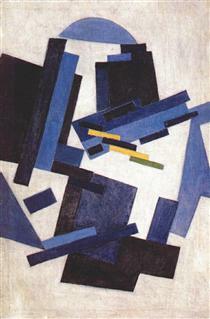 Rozanova later exhibited four works in the First Free International Futurist Exhibition in Rome, which took place from April 13 to May 25, 1914. 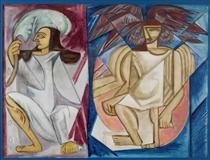 Other Russian artists featured in the exhibition included Alexander Archipenko, Nikolai Kulbin, and Aleksandra Ekster. 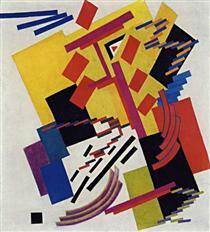 In 1916 she married Aleksei Kruchenykh and joined the group of Russian avant-garde artists Supremus that was led by Kazimir Malevich. 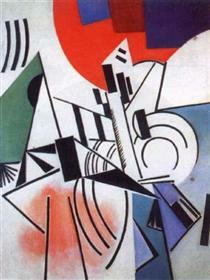 By this time her paintings, developed from the influences of Cubism and Italian Futurism, and took an entirely original departure into pure abstraction in which the composition is organised by the visual weight and relationship of colour. 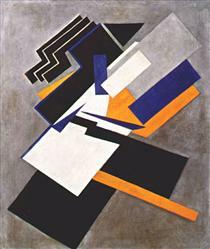 In the same year Rozanova together with other suprematist artists (Kazimir Malevich, Aleksandra Ekster, Nina Genke, Liubov Popova, Ksenia Boguslavskaya, Nadezhda Udaltsova, Ivan Kliun, Ivan Puni and others) worked at the Verbovka Village Folk Centre. 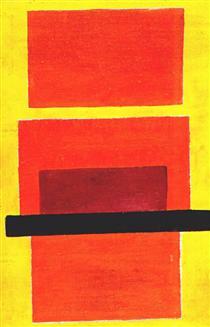 From 1917 to 1918 she created a series of non-objective paintings which she called tsv'etopis'. 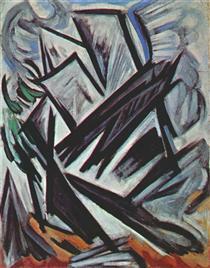 Her Non-objective composition, 1918 also known as Green stripe anticipates the flat picture plane and poetic nuancing of colour of some Abstract Expressionists. She died of diphtheria at the age of 32 in 1918 following a cold she contracted while working on preparations for the first anniversary of the October Revolution.